We have no central heating! Our woodstove is our main heat source although we have electric heat on individual thermoststats in the bedrooms. Relying on the woodstove can be a bit of a chore but it is economical. When I was at building college it was proven that most modern houses don't even need central heating but people insist on it because thats whats expected. I don;t mind the chore of a wood fire, in fact I've always enjoyed the ritual of it! We only have central heating and I would love a wood burner but the council rejected our planning for a chimney or flue. fortunately our house does hold the heat so we haven't had to put the heating on yet. It's a bit nippy in the mornings but once your up and dressed you don't feel it. Still no heating on here, although when the new baby arrives we'll have to ahev it on then to make the place a bit more comfortable! A basket of wood seems to last over a night at the moment but I'm not getting it that hot yet! I have a wood furnace that is central heating as it has built in blower and 8 inch duct. I ran my own duct system and it heats the whole house with 4 sticks of wood. I have to put more in about every 4 hours. We have a ducted propane system for backup. Is there nothing you don't build yourself! That sounds a great system for a farm to have. I'm not sure I'd have enough wood to run that for the winter here yet though! I bet you have to get a fair bit of firewood ready for the winter. No central heating in our house so the woodstove has to heat us up.We love it..it kicks out heat like no one's business ...I just hate having to split and stack all the wood. 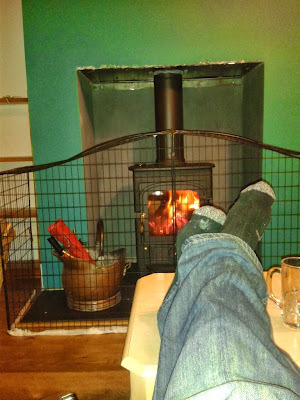 We just installed a small woodstove and it is heating the house very nicely. Our house is small and well insulated. We can uncomfortably warm without much effort. Of course we are not yet in the low temperatures. Probably similar temps to what you are having.